Music Hath Charms, a Norman Rockwell painting, appeared on the cover of The Saturday Evening Post published November 4, 1939. This is another favorite of Rockwell collectors, a classic enduring image of the world Rockwell painted. An alternate title for this painting is Sheriff Guarding Jail Cell. 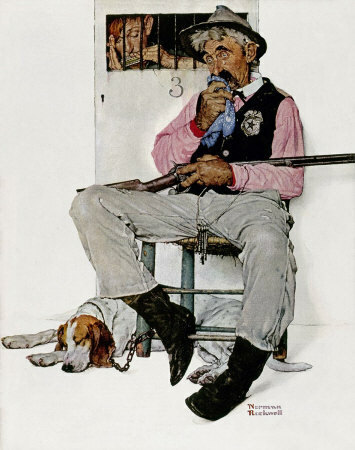 This painting was Rockwell's 190th overall out of 322 total paintings that were published on the cover of the Saturday Evening Post. Rockwell's career with the Post spanned 47 years, from his first cover illustration, Boy With Baby Carriage in 1916 to his last, Portrait of John F. Kennedy, in 1963. This was also the seventh cover for The Post in 1939. In 1939, there were eight Norman Rockwell Saturday Evening Post covers published. The original oil on canvas painting, 28 x 22 inches or 71 x 55 cm, is part of a private collection. One study also appears on page 143 of The Norman Rockwell Catalogue. In this painting, Norman Rockwell shows us how musical ability can sometimes be used to an advantage. The inmate in Cell Number 3 has a harmonica, and he knows how to play it. He is apparently playing a sad song. Either that or he has hit a chord with the sheriff's psyche. Maybe he is playing the sheriff's mother's favorite song or hymn. Or maybe he is playing the sheriff's sweetheart's favorite melody. You know, the one that the band was playing when they met. Either way, the sheriff has been moved to tears. He still cradles his rifle, but he has been moved. The guard dog is asleep, so he senses no danger. Music Hath Charms was only one of 322 Norman Rockwell Saturday Evening Post covers; Here is the list of Norman Rockwell Saturday Evening Post cover illustrations. The prisoner keeps on playing, not paying any attention to the sheriff. He is just enjoying his own music. The sheriff is modeled by Arlington, Vermont Under-Sheriff Harvey McKee. When Mr. McKee showed up to model for the painting, Rockwell noticed his badly swollen left hand. You can see how swollen it is in the painting. He also had a broken collarbone. Some men had beaten him as he attempted to rescue a girl in a deserted shack. Harvey decided to go ahead and pose with his hand swollen. Rockwell captured every detail. Do You Have A Great Story, Opinion Or Contribution About Music Hath Charms?